As the music fades and a chasm separates her from the passion of her heart, will Lucy’s faith song go silent, too? Find out in Cynthia Ruchti’s new book, Song of Silence. The musical score of her life seems to be missing all the notes. When a simple misstep threatens to silence Lucy forever, a young boy and his soundless mother change the way she sees—and hears—everything. Celebrate the release of Song of Silence with a blog tour and giveaway. Two winners will be chosen! Enter today by clicking the icon below. But hurry! The giveaway ends on May 9th. The winners will be announced May 10th on Cynthia’s blog. I’ve never been much of a pianist myself- though I do take lessons – but thanks to Cynthia’s excellent writing, I can easily relate to the main character in this story. I cannot begin to imagine how I would go on if I were forced to stop writing . . . but it’s easy to put myself in Lucy’s shoes. Despite the apparent loss of hope, it is a wonderful story – one I highly recommend! Lucy and Charlie Tuttle agree on one thing: they’re committed to each other for life. Trouble is, neither of them expected life to look like this. Charlie retired early, but Lucy is devoted to a long-term career . . . until the day she has nochoice. Find out more about Cynthia athttp://www.cynthiaruchti.com. Motherhood is a 24/7 job. Join young Amish homemaker Marianne Jantzi in her family’s life on the snowy plains of Ontario in Marianne’s new book, Simple Pleasures. Never sugarcoating the frustrations of motherhood, Jantzi tells it like it is, broken washing machine and bickering children and all. But through her busy days, Jantzi finds strength in simple pleasures of family, fellowship with her Amish community, and quiet time with God. Do you enjoy reading about the Amish . . . about their simple lifestyle, about their relationship with God, about their wonderful community? This is NOT a book to be missed! No, it’s not all happy, skipping children and beautiful, sunshiny days full of bliss. I enjoy reading Amish fiction, but this is real life! And that, simply cannot be put into the same category. Somehow these stories of a real life among the plain folk goes so far above and beyond what we see in Amish fiction. Why? – because it’s different on so many levels . . . because it’s REAL! Read it. You’ll see exactly what I mean! Young Amish homemaker Marianne Jantzi invites readers into her family’s life on the snowy plains of Ontario. The mother of four young children and wife of a storekeeper, Jantzi writes about her daily routines and heartfelt faith with equal measures of wit and warmth. Sewing, cleaning, cooking, gardening, and helping to manage the store take up most hours in her day, but Jantzi finds time to pen columns for the Connection, a magazine beloved by Amish and Mennonite readers across the United States and Canada. Never sugarcoating the frustrations of motherhood, Jantzi tells it like it is, broken washing machine and bickering children and all. But through her busy days, Jantzi finds strength in simple pleasures of family, fellowship with her Amish community, and quiet time with God. Marianne Jantzi is an Amish writer and homemaker in Ontario, Canada. Formerly a teacher in an Amish school, Jantzi now educates and inspires through her “Northern Reflections” column for The Connection, a magazine directed mainly to Amish and plain communities across the U.S. and Canada. She and her husband have four young children and run a shoe store among the Milverton Amish settlement of Ontario. Find out more about Marianne at http://store.mennomedia.org/Simple-Pleasures-P4687.aspx. If you are a fan of Jan Drexler’s Love Inspired stories, don’t miss her NEW novel from Revel! I thought this was Jan’s debut – and I was pleasantly surprised to see it was not. Now I know there are more books I can go hunt down to read while I wait for her next release! Whether you enjoy historical fiction, Amish fiction… or both… this is a story you don’t want to miss! Jan Drexler clearly does her research – and does it well. Then she crafts a beautiful story around that foundation. OK. I’m off to go track down her other books by Love Inspired! Hannah Yoder loves her quiet life on the banks of the Conestoga Creek. In 1842, this corner of Lancaster County is settled and peaceful–yet problems lurk beneath the placid façade. Hannah’s father worries about the spread of liberal ideas from their Mennonite and Brethren neighbors. And Hannah blames herself for a tragedy that struck their home nine years ago. She strives to be the one person who can bind the threads of her family together in spite of her mother’s ongoing depression and her sister’s rejection of their family. But her world is threatening to unravel. 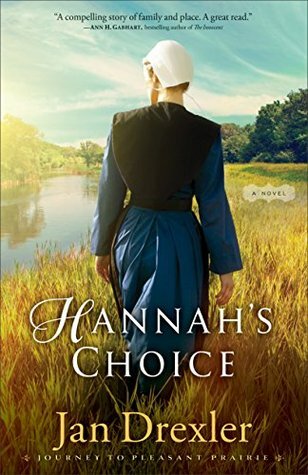 When two young men seek her hand in marriage–one offering the home she craves and the other promising the adventure of following God’s call west–Hannah must make a choice. Faithfully perform her duties to her family? Or defy her father and abandon her community?